Crews use excavating equipment to clear a path for investigators with the state Fire Marshal's Office. BIDDEFORD — Kelli Howard was playing with her two cats, Max and Caesar, in her second-floor apartment Sunday evening when the felines suddenly bolted past her. She thought she heard water dripping and worried that the pipes had burst again. But when she saw an orange glow through the cracks in the hardwood floor, she realized the sound was actually fire crackling. Howard and others in the rear of the building escaped onto the porch and down the back stairs. The fire that broke out at 6 p.m. Sunday at 25 Green St. took more than 100 firefighters and crews from many surrounding communities hours to extinguish. It destroyed the building, and at midmorning Monday an aerial ladder was still directing streams of water onto smoldering areas. Inspectors initially deemed the building too dangerous to enter, but after an excavator hauled debris out of the back of the building, investigators with the state Fire Marshal’s Office, the Biddeford Fire Department and the federal Bureau of Alcohol, Tobacco, Firearms and Explosives were able to get inside Monday afternoon to search for a cause. They seemed to be concentrating their efforts on the center of the first floor at the back portion of the building, where the storage units for the apartments were located. That’s where Howard said the flames seemed to be coming from before they swept through the building. Sgt. Joel Davis of the fire marshal’s office said investigators are confident the fire started in the storage area, but because it burned from the ground floor to the roof, they are not sure which floor it started on. They also do not yet have a cause or know whether the fire was accidental or intentional. “We just started interviewing occupants and tenants. We’re kind of in the early stages of the investigation,” Davis said. Everybody got out of the 12-unit building without serious injury. The fire came on the heels of a fatal fire at 35 Main St. on Sept. 18 and another three days later a few blocks away on Simard Avenue. A fire Nov. 1 on Noyes Street in Portland killed six people, and a fire in Caribou last week that was set by a 3-year-old boy killed him, his two siblings and their mother. Steve Hazleton, who lives in a single-family house next door to 25 Green St., said the number of fires lately is unsettling. “I hope to God this was an accident,” he said. Hazleton said he and his girlfriend were cooking dinner when they saw flames next door. Hazleton said the fire was initially confined to the back porch, and he thought it would be put out quickly. Instead, firefighters dumped hundreds of thousands of gallons of water on the building – so much that water poured out the windows. Hazleton said he heard no smoke alarms go off. “I said to my girlfriend, with all this fire, with 12 apartments, we should have at least heard a few smoke alarms,” he said. The building had been inspected in 2009 and the owner at the time was instructed to install eight hard-wired smoke detectors, which he apparently did. Residents reported hearing smoke detectors going off, but it was after they had already been warned about the fire. Resident Dennis Lund Jr. said he learned of the fire when a neighbor knocked on his door. Lund, who is partially deaf, said the special smoke detector with a blinking light in his third-floor apartment had not gone off. Lund said he stayed to retrieve his two cats but then was told to leave by firefighters who were searching the building. Lund said he left his apartment in the front of the building and went down the stairs to leave but couldn’t get the front door open. “I was trapped. It was getting full of smoke,” he said. He said he had to go back up the stairs and use a different stairway to find a door that worked. Once outside, he was treated for smoke inhalation, as was one of his cats. Lund suspects his possessions were lost in the fire, although his important papers were in a fire safe that he hopes came through the blaze intact. Lund said the city has told him they’ll help him find temporary housing and other necessities. 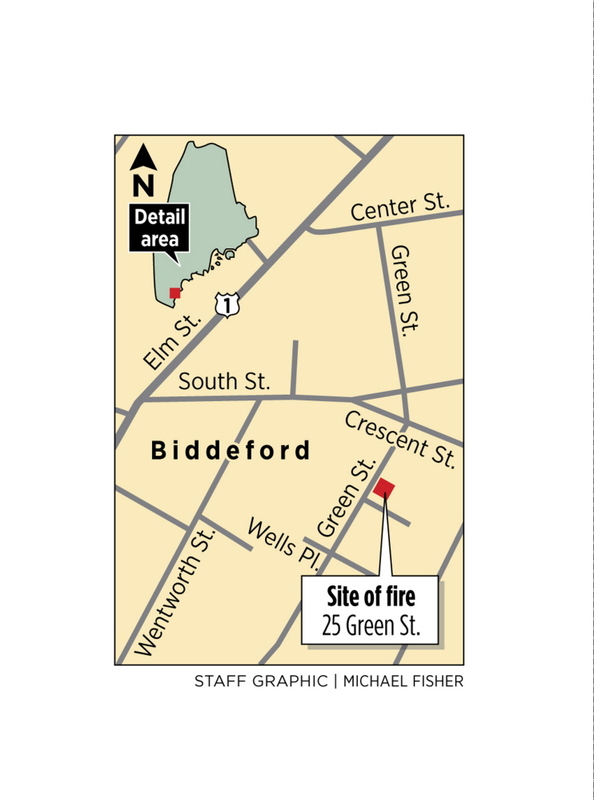 Biddeford Deputy Fire Chief Paul Labreque said firefighters at first had difficulty getting enough water pressure because so many companies were tying into the available hydrants. He said the water district boosted the pressure in the water lines. He said firefighters initially were able to search inside the building but then had to retreat. John Lamb, a spokesman for the American Red Cross of Maine, said three families were placed in emergency shelters by the city and another family was being put up by the Red Cross. The remaining residents stayed with friends or family, he said. 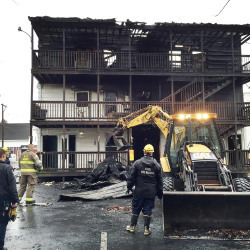 In addition to displacing between 15 and 20 residents from 25 Green St., the fire also displaced the occupants of three apartments next door at 23 Green St.
Salamonski found two of her cats, Ignatz and Sundance, but a third, Butch, is still missing. Salamonski said there was 7 feet of water in the basement, and that it was coming up the stairs to the first floor. Cynthia Butland, also a resident at 23 Green St., said much of her and her boyfriend’s furniture was waterlogged and there was debris throughout the apartment as firefighters worked to make sure no fire spread across the narrow gap between the buildings. She said the Red Cross made arrangements for them to stay at a local hotel for four days – through the Thanksgiving holiday. “I’m thankful we have our lives, that’s what I’m thankful for,” Butland said, her voice catching with emotion.